Look around your kitchen and you’ll probably see the old standbys on the counter: the coffee maker, the food processor, the toaster oven. They’re great to have on hand, but what you may not know is that they can actually help you save money when you use them to their full potentials. 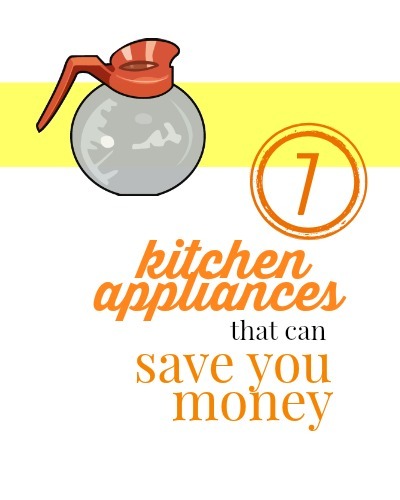 Here’s a list of some kitchen appliances that can help you save money. 1. Slow Cooker. We all know that slow cookers are convenient, but how can they save us money? Use them to freezer cook! Buy produce, meats, and other items when they’re on sale, create uncooked meals and freeze them in a storage bag, and cook them in the slow cooker. You’ll be saving time and money with this method. For more information and recipes, you can check out my post on how to freezer cook with a slow cooker. 2. Vacuum Sealer. One way to save on meat is to buy it in bulk when you can find great prices on it (see my post on how to save on meat for more information), but if it gets freezer burned, it sort of ruins the fun of the good price. A vacuum sealer keeps meats really fresh in the freezer with no worry of freezer burn. And it’s not just limited to meat; you can pretty much vacuum seal anything you want to freeze. 3. Food Processor. Food processors are great for chopping your own veggies and making sauces, but they are also super great for shredding cheese. Buy blocks of cheese when they’re on sale, shred the cheese, and freeze it. Plus, hand shredded cheese is so much better than the bagged kind. 4. Bread Machine. Save money on bread by making your own. You probably know that freshly baked bread is so much better than store-bought, but making it by hand can be a little tedious and time-consuming. A bread machine helps you achieve the frugalness and deliciousness of home baked bread and most machines are pretty simple to use. 5. Mandolin. Skip the little containers of pre-sliced veggies in the produce section (those things are way overpriced) and cut your own. Using a mandolin slicer can help you get super thin and uniform slices of potatoes, squash, carrots, and more. 6. Small Toaster Oven. These little ovens not only heat up quickly, but they can also help you save a chunk of change by not having to turn your big oven on. They’re especially good if you’re only making a small serving of something. There are even some small ovens that are big enough to cook a frozen pizza. 7. Coffee Maker. Stopping at the coffee shop on the corner before you head into work may be a habit for you and you likely know that the high prices can add up quickly. A cup of coffee at Starbucks is around $2.35. If you used your own coffee maker at home, you could save a ton. Let’s say you grab a pound of good coffee on sale for $5.99. You’ll get about 48 cups from that pound. That’s 12¢ per cup of coffee! Starbucks every day for a year=$857.75. Brewing at home every day for a year=$43.80.